A thing of beauty on Thursday, with mismatches all over the secondary. Witten broke out for his biggest game of the season, and Miles Austin had a 3rd monster game of the season. Remarkable player. Slow day for Crayton and Roy (again) and it looked like the Cowboys are making an effort to utilize Felix as a pass-catcher, although they still haven't quite figured that one out. Miles Austin is a beast. It had to be said. It is time to break down what Jason Garrett called in the Oakland game, and it might be time to dust off a theory or two about how Offensive Coordinators do what they do. Again, it is possible that I am out in left field with some of my offensive theories, but if you didn't know that already, then I should tell you that I am, in fact, not a former NFL coach. Anyway, having said that, I think what we saw on Thanksgiving was pretty interesting stuff. We saw them play up their tendencies to such an extreme that I can only assume they want future teams to see this film and then draw from the Thanksgiving assumptions. My theory is that the Cowboys might be leaving some cheese in the mousetraps, hoping the Giants or Chargers might eat some of it. Let me explain: Check out the "22" package. This is Deon Anderson in front of the TB, with 2 TEs on the field. Over the course of the season, the Cowboys run out of "22" nearly 80% of the time. On Thursday? 13 out of 14 were runs, and they dominated for 114 yards on 13 carries. In fact, later on, I will show you that they pretty much ran one play over and over again. By the way, they have now run 81 running plays out of "22" this season for 525 yards - 6.48 yards per carry. This is a power run team. It is worth noting that they only other game this year where they ran more "22" plays was Week 2 against the New York Giants. Next week's opponent? The New York Giants. Interesting. OK, but check this out: Shotgun snaps totaled 24. There were 12 snaps out of "S11", 11 out of "S12", and 1 from "S21". All 24 of these plays were pass plays for 202 yards. Whenever you see 24 for 24, you can only assume that Garrett is either amazed that the Raiders are not figuring this out or that he is telling the Giants that he "never runs in this scenario", as he plots a "Pearl Harbor". Definition of the Personnel Groups, click here . Unlike Sunday, this was an absolute fine case of "Taking Care of Business". Instead of using all 60 minutes of the clock to secure a victory, the Cowboys seemed to put their Thanksgiving opponents to the sword well before halftime. The Raiders seemed to cooperate, but let's give the Cowboys full credit for accomplishing their top 2 goals. 1) - Figure out how to turn 2-2 into 8-3 by the day after Thanksgiving. This would put you in a great spot entering a very formidable December schedule. As they say, "make hay while the sun shines", and they did. Full marks to the Cowboys for getting through October and November with a record that can certainly be used to allow a small amount of wiggle room in the final 5 games. 2) - Enter December with a little momentum from the offense. Again, it was just the Raiders, but to get 10 explosives (plays of 20+) and nearly 500 yards of offense was a spectacular show of force, and now they can rest for 10 days knowing what they are capable of. The alternative would have been to head to New York to play the Giants with the complete lack of momentum from the Green Bay and Washington games and try to fight through that doubt in the back of your mind against a desperate Giants team. I have to believe the assurance that Miles Austin, Jason Witten, and Felix Jones are all prepared to make a game-breaking play puts them in a confident spot for December 6. The offense is the big story from Thursday, and the big story inside the big story is the fact that Miles Austin did it again. When you have 7 catches for 145 yards and it is only your 3rd best performance of the year, you know you have an elite Wide Receiver. We have been around this discussion plenty this year, but let's all admit that contracts, fantasy football draft position, jersey sales, and national reputation do not a star player make. The only thing that makes you a star player in this league is making plays again and again and again. Despite the first 4 games where he was a complete after-thought in this offense, Austin now is almost assured a 1,000 yard season (he needs 176 more yards in 5 games) and has proven that he can get open and make a play. To think that this guy was only a "prospect" 60 days ago is a tough thing to wrap your arms around. He has taken the job and run with it, and I don't think it would be too soon to find a way to pay that man to insure his future his secure as a Dallas Cowboy. And then there is that running game. Balance is a nice thing, right? Obviously, you would like to play the Raiders every week, but let's remember their defense is not really that bad. The Cowboys ran for 195 yards on 25 carries - a staggering 7.8 yards per carry. Again, not to get too demonstrative here, but I really feel that anyone that doesn't think the Cowboys are a "power running team" is ignoring a building mountain of evidence. It is truly staggering how devastating a run team they are, and equally staggering to me that they have only not had success on the ground in 2 games - 1 in which they never really tried to run it (Green Bay) and 1 in which they had only 1 healthy RB (Choice in Denver). When the Cowboys run the ball from a power posture (multiple TEs and/or a FB) there has been almost nobody who has stopped it. It was their 8th game of running for over 100 yards, and their 4the game of running for more than 150. They can run the football right at you, and you cannot stop it - a very valuable trick in December if you can remember it, Jason. 8-3 required no real slips along the way after losing 2 of the first 4. But, the Cowboys did a nice job of taking care of their business and then were given the added bonus of the 5-0 Giants turning into the 6-5 Giants. They enter December in the driver's seat in the NFC East and now they can cast history aside and get after the true meat of this meal. * Anthony Spencer had his first 2 sacks of the season! I have been watching this guy very carefully over the last month to make sure he is pulling his weight despite his 0 sack total through 10 games. I must tell you that I feel that he is flying around the ball and causing problems. I think Anthony Spencer has played very well in many departments of his game, and for this reason, I have had no problem with his performance beyond the pass rushing results. Even there, Spencer has had as many hits on the QB as anyone, but still 0 sacks. Yesterday, he had 2, and almost had 2 more, so perhaps he is starting to take off and get some results. His 1st sack of the season was exactly the way we saw him getting 8 or 9 sacks this season in our preseason projections - 94 flushes the QB right into 93's arms. It shouldn't take 11 games for this to happen. * The Roof was open. Amazing. I know I should not take any credit for it, but for some reason, I felt satisfied with the change. * In the 1st Quarter, the Raiders started the game with quite a few big running plays; Fargas +21, Fargas +12. McFadden +12. In the first 6 carries, they had gashed the Cowboys for 58 yards. The, on 2nd and 6 from the 46 on their 3rd drive, the Cowboys rolled out the 3-5 package. I cannot tell you how many times they ran it, but it was clear that once they saw the Raiders were running with success, they rolled out Ware-Brooking-Carpenter-James-Spencer all at the same time to snuff that threat out - while only playing 3 DBs. Raiders running backs were 15 for 36 yards the rest of the game. * Sebastian Janikowski did not step on the field until the 2nd half kickoff. Not sure it pays to have an elite kicker if you are the Raiders. * When did it become ok to field punts inside your 10 yard line? Did I miss the memo or did both teams violate one of the most basic edicts of special teams multiple times? * I like the Cowboys deciding to use a little play action, including the Red Zone touchdown to Roy Williams. One critique: When using the play action fake, make sure the RB runs in the same direction as the fake handoff. A fake to nobody is not nearly as convincing to the defense. * If I were to predict one of Norm's "5 plays that affected the game that you might not remember" for today, I would say the safe money bet for #1 would be the mark of the Miles Austin catch on 3rd and 11 early in the 2nd Quarter. It was the Cowboys 4th drive and they enjoyed just a 3-0 lead. It was 3rd and 11 from their own 10 yard line, and Austin made the catch and then had to twist and fight for the final few yards. I thought he was short, but he got the favorable spot and made the 1st down by a link of the chain. 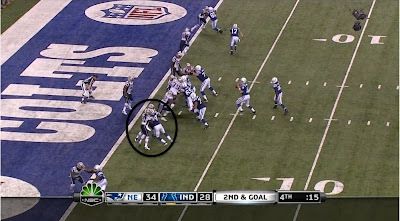 2 plays later, there was a 27 yard catch to Austin, and 1 play after that Felix Jones broke a 46 yard touchdown run. 10-0 Cowboys, and the Cowboys had taken off offensively. If that was a 3-and-out, the offensive frustration could continue and the boo birds might make an appearance. 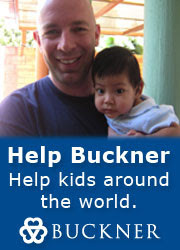 * Keith Brooking, Jay Ratliff, and DeMarcus Ware all need trips to the Pro Bowl. I am confident that Ratliff and Ware will both be there, but will Brooking? That needs to happen. * What offers less insight than putting a microphone on a coach and the entire audio segment features him yelling "nice run! nice block!". Pointless at best. * I don't want to get into Roy Williams again, but 2 catches for 15 yards does not change his role in the offense in my mind as we head to December. One thing I was very happy to see from the Cowboys offense was finding Jason Witten down the seam. It used to be a wonderful staple of this offense, when Witten finds a LB mismatch, and the Cowboys gain an easy 37 yards. Apparently, the Raiders are not going to let the rest of the league's philosophy of covering Witten with a safety. I liked it, though. Rest now for the banged up Cowboys. 5 Games to go, with the most oppressive element of this stretch is attempting to tune out the questions and conversations about Cowboys historical failures in December. Keith Brooking reminded the media that those teams have nothing a darn thing to do with this team. I agree with his premise, but that won't keep the stories from being written. Prepare for the stretch. Today's Thanksgiving opponent for the Dallas Cowboys is the Oakland Raiders. Because of the short week and a full house of family, I haven't analyzed the enemy in the normal depth that you perhaps have grown used to over the first 10 weeks of the season. I could give you 3,000 words or twice that on how the Oakland Raiders are where they are. They are a joke of an organization right now that has shown an amazing ability to continue to butcher picks in the top 10 of the NFL Draft. No matter how good they appear to be on draft day, rest assured that if the Raiders sink their hooks into someone (JaMarcus Russell, Darren McFadden, Robert Gallery) chances are they will never come close to the optimistic projections that are fed to the public from Mel Kiper or Mike Mayock. On the other hand, we have also enjoyed the inevitable "Raiders Reach" where they grab someone in the top 10 who nobody else thought would go there, like this year's #7 pick, Darrius Heyward-Bey, who had just 600 yards at Maryland last season. Heyward-Bey, taken before Michael Crabtree, has a mere 7 catches in 10 games including only 1 game of more than 1 catch, while allowing Crabtree to get to the other team in the Bay area, San Francisco. Don't think that the football fans in that neck of the woods are comparing those 2. I could also give you a write-up on how they have continuously bet on veteran players with large contracts that turn around and backfire. In the last 2 seasons, Javon Walker, Tommy Kelly, DeAngelo Hall, and others all come to mind. This team is a mess. And how did the Raiders get here? Part of it is merely the cyclical nature of the NFL, I suppose. They were just in a Super Bowl following the 2002 season, so somehow they got it right this decade. But the biggest part of it is this team's structure where the owner makes any and all football calls while always making it impossible for coaches to coach and personnel people to make their calls and do their jobs without being over-ruled. Al Davis, a man who knows more about football than any owner in the league, is perhaps the ultimate meddling owner - drawing parrallels to Jerry Jones constantly, but generally winning the contest of "who is the most over-the-top owner in the NFL?" It has nothing to do with "not knowing football" which is what some people have said over the years about Jerry Jones "meddling". It is what happens when someone is set in their ways and makes the calls because this is his team and nobody is going to over-rule the owner. And then, of course, because it is the owner - there is no accoutability for the decisions that are made. If he is the owner, he certainly is not going to be fired. And that is why this can go on for decades. 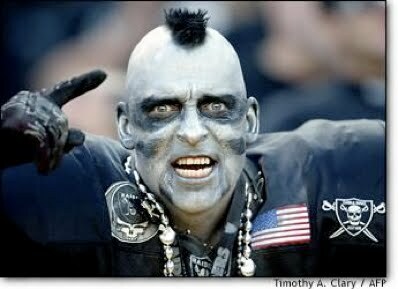 It is the day before Thanksgiving, and technically, I owe you a Oakland Raiders "Analyze the Enemy". But, with much family in the house, I think I will gracefully decline, and offer a Thanksgiving Morning edition of "Game Plan" so check back tomorrow morning. 2 in a row? Excellent. Now, how about 3? On Monday night, the Stars took down a spirited crew from Carolina who were happy to engage in another physical confrontation that barely made it 1 shift before the fists started flying as Brenden Morrow and Tim Gleason got at it 25 seconds into the game. I always feel there must be a good story behind a fight before anyone breaks a sweat, but regardless of any bad blood, it got the arena going quickly. Seen Brenden on a mission early was a welcome sight, as James Neal continued his suspension. Therefore, it was vital that this team not sleep-walk through another game with an Eastern Conference floor mat, and the Stars put together a solid, 60 minutes of hockey in beating the beat-up Hurricanes, 2-0. Aside from the Morrow fight, the true talking point of the game was the Stars killing of a 5-3 power play early in the 3rd period, in a spot where Carolina had plenty of time (1:38) to get a momentum turning PP goal. But to the extreme credit of those killing off the penalty, they got it done. I am interested in telling you who was a part of that, just in case the excitement clouded your memory, because the arena was going bananas after that kill. Trevor Daley spent 1:47 on one shift helping to kill off that penalty. In fact, he had 24 shifts on Monday night, and in the 3rd period was forced to stay out there and kill off the game for 8:21 of the 3rd. Compared to the 6:19 in the 1st and 5:29 in the 2nd, you could see that Robidas and Daley were being stretched as the game went on to kill off the game in which Nik Grossman had to sit out. Anyway, the 5-3 was a lot of Daley, Robidas, and Fistric - with the forward being Loui Eriksson and Jere Lehtinen. I wonder if Eriksson will start to get some sniffs for the Selke award as top defensive forward in the NHL in the years to come? Lehtinen obviously knows all about that trophy, but the way Eriksson has developed, I think people are going to start and suggest his 2-way play deserves recognition. The Stars certainly do, as he is always asked to help kill off games in big spots - and what bigger spot than an extended 5-3 kill in the 3rd period. Also, Brad Richards is on quite a stretch of amazing hockey - so much so that some of us may not realize it. 3 players in the NHL have more points than Richards right now. Let me repeat. 3 players in the NHL have more points than Brad Richards: Anze Kopitar in Los Angeles (33), Marian Gaborik of the Rangers (32), and Joe Thornton in San Jose (32). And there you have it. Richards, in just 21 games has 28 points, putting him on a career high pace. At the same time, let's not act like we are too surprised; he has scored 87 points in his first 89 games with the Stars, so the quality is surely apparent. Since the day of the trade, 2/27/08, Brad Richards has turned out nearly a point a game. Mike Ribeiro has nearly done the same trick - except Ribeiro hasn't missed extended time with injuries, too. Ribs has 107 points in 117 games, Eriksson has 90 points in 120 games, and Richards 87 points in 89 games. That trio has put the Stars in the middle of a lot of entertaining games along the way, and they continue to light the lamp at a furious pace. When you have scorers like that, you always have a chance. I wonder if Brad Richards can stay in the scoring race all season. That would be most impressive, indeed. Tonight, Blues and Stars at 7pm. Note the early start time and get there even a bit earlier to celebrate along with both teams the induction of Brett Hull into the Hall of Fame in a pre-game ceremony at 6:55 pm. Being both a fan of Notre Dame and any quarterback prospect anywhere (more good quarterbacks is a good thing), I was quite interested when Brady Quinn opened last weekend's game with impressive drives that ended in long touchdown passes. The big question here, as it always is when playing the Lions, was how much of the performance was related to Quinn and his teammates playing solid football and how much of it was the Lions' defense failing to do so. Every Friday during the 2:00 hour, BaD Radio will make their picks of the week. Whoever gets the fewest correct over the course of the season will wear a nice suit and tie during the entirety of the NFL playoffs. In addition, the loser among Bob, Dan and Donovan will wear the same attire during Super Bowl week in Miami. 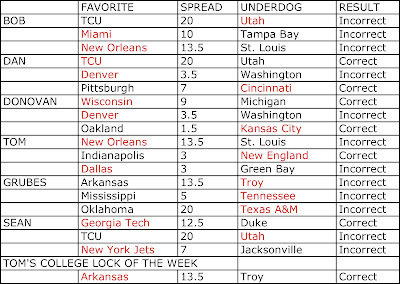 Picks will be in red. Not a great passing day from Tony Romo for sure. 15-26 is not that far below his season completion percentage (61%). The issue, of course, was his ability to compelte a pass to a WR. 0-4 to Roy Williams is nothing new but not good. 3-3 to Martellus Bennett demonstrated a slight rhythm before it looked like a high throw did render him somewhat ineffective the rest of the day. Here are the numbers for you to see on Sunday's game versus the Redskins. As a review, one week after 43 Shotgun snaps on 58 plays , the Cowboys ran only 23 Shotgun snaps in 61 plays. Again, the object of the game is not to have a run/pass balance, but rather a majority of 1st and 2nd Down needs to be "under center". 35 plays with multiple Tight Ends showed a conviction for running the ball, and again, let's remember that they ran for 5 yards per carry, which is slightly lower than their season total of 5.14 yards per carry, 2nd in the NFL behind Tennessee. Don't let anyone tell you this team is not a power running team. They are ignoring hard evidence. There are 16 games in the NFL most weekends, and 16 teams get beat each of those weekends. The object of the game is to avoid being one of those 16, and, of course, if you can do that often enough, when your 16 weekends of trying to avoid being one of those 16 losers is over, then you get to play game #17. The Cowboys, despite playing one of their ugliest games of the season for much of the day, grabbed a crucial win on their way to playing game #17 this season, with a 7-6 win over their rival, the Washington Redskins. Know this: A loss would have deeply wounded this team's ability to make the 2009 NFL Playoffs and hopefully to win the NFC East Division. Nobody wants to hear this the morning that the team played well below expectations, but the number 1, 2, 3, 4, and 5 priority was not to "look good" or "score 30", but rather to get a win and get to 7-3. Once that is accomplished, we can discuss how sharp they looked or the opposite. 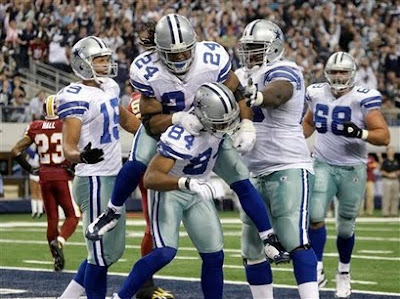 I think something can be said about the 2009 Cowboys team that we may not have said about the 2008 version: They have the ability to figure out how to scratch out a win in bad circumstances. The game at Kansas City and yesterday's game against Washington prove that there are times when like the starting pitcher that doesn't have his "good stuff", and in those times you still have to win that game somehow. Ask Philadelphia about their trip to Oakland and Green Bay about their trip to Tampa Bay to discuss their experience with this phenomenon and whether those experiences would be less painful if they still had an ugly win to show for it. They did that. They did figure out how to find a Win in there somewhere. They beat an injury-depleted team that suffered even more injuries as the game went on. Like I said, a loss to the Redskins would have been catastrophic to the Cowboys hopes in 2009, but there wasn't a loss yesterday. The win is worth just as much as the win in Philadelphia 2 weeks ago. March on. According to my count, this will be the 97th meeting in what many suggest has been the best rivalry in the NFL over the last 50 years. Personally, I might take issue with that claim - even for a Cowboys rivalry I prefer both the Giants and the Eagles (but I am told that proves I have only been a close observer of Dallas Cowboys football since 1998), but regardless, it is still about as storied as they come. You don't have to be a great student of the rivalry to know that the beauty of Cowboys-Redskins is that, for once, you can really believe the tired cliche' of "you can throw the records out when these two teams play eachother". You see, it is actually true! Whether it was 1989 when the Cowboys got their only win at the hands of a good Redskins team, or in 1995 when the Cowboys were swept by the Redskins before they won their 3rd Super Bowl in 4 years. 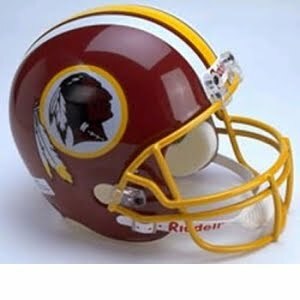 That season, the Redskins played 2 QB's, Heath Shuler and Gus Frerotte, and each of them beat the Cowboys when they got the chance. Crazy. It makes no sense. Dave Campo could only must 15 wins in 48 games in his 3 years as Cowboys coach, and 5 of them were in 6 games against Washington. The Cowboys, who are 20 games over .500 in this series won 14 of 15 from 1997 to 2004, when the Cowboys were not playing their finest football. Then, when things started to turn towards quality returning to Dallas' organization from 2005-2008, the Cowboys confusingly have now dropped 5 of the last 8 games against those Redskins. NFL players seldom dig through the historical archives to find these facts. They have their jobs, and I have mine. They merely talk to their buddies around the league to find out which teams are good and which teams are jokes. That is why this stuff never changes. You know that this is a serious rivalry, and I know that this is a serious rivalry where anything can and will happen, but the players never learn this lesson and that is why it can happen again on Sunday. In the preseason publications back in August, most people thought the Washington Redskins would likely finish 4th in the always difficult NFC East. But, I am not sure anyone thought that this much chaos would be waiting ahead for them in 2009. 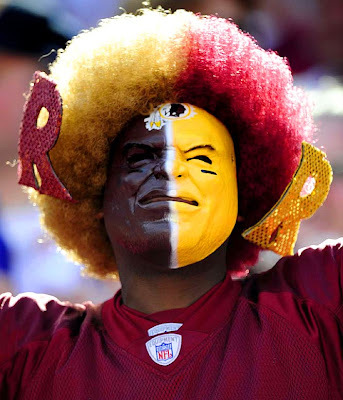 It has been one of those disheartening years that has tested the resolve of even the most hard-core Redskins loyalist. They sit at 3-6, presently, and are coming off the best win of their season when they beat a Denver team that is in the middle of its own slump by getting plays from unfamiliar names like Hunter Smith and Todd Yoder. On the road this year, the Redskins are 0-4, with losses against a few good teams like the Giants and Falcons, but also they distinguished themselves as the team that helped break the Detroit Lions 19-game losing streak (the 2nd longest losing streak in the history of the NFL) at Ford Field back in Late September. A loss all the more humiliating because so many people were picking the Lions to win that Friday across the league - which of course means it wasn't that much of an upset. Much of the blame of this version of the Redskins seems to head directly to its current head coach, Jim Zorn, who was hired amidst confusion, and has appeared to be a "Dead Man Walking" for weeks. The Redskins want him gone, but know that firing him now would be costly and wouldn't solve a thing. So, they humiliated him (Sherman Lewis) and hoped he would resign. He knew that this meant leaving the paychecks behind, so he has refused to do that, but rather hang in there and demand that he gets every cent owed to him. Between all of the blog entries since the Green Bay game, and the debates that followed on the air with Norm, I thought I would share some emails and and offer a few more items of interest before we put it all to bed and prepare for the Redskins game which will be here in no time. Facing a critical juncture in the season, Capers dusted off some blitzes he hadn't used this season and applied consistent pressure on the Cowboys, sending everyone from inside linebackers Nick Barnett and A.J. Hawk to cornerback Charles Woodson to safety Nick Collins. The Packers sacked Romo five times and chipped in three other tackles for loss in holding the Cowboys to a season-low 278 yards. Now that he's seen what his unit can do when turned loose, is Capers going to keep his foot on the accelerator? "These guys know we will be as aggressive as we can be and have success," Capers said of his fourth-ranked defense. "I've never been around a player yet that doesn't like to be aggressive. And we certainly like to dictate the tempo of the game and I thought we were able to dictate the tempo of the game yesterday." But many coordinators have promised to blitz aggressively only to back off because of the risk factor, so what he said Monday won't necessarily hold true next Sunday. Capers said he was able to blitz so much because the Cowboys became predictable, eschewing the run early in favor of a pass-happy attack. Another reason Capers might dial down his blitz calls is that the next opponent, the San Francisco 49ers, have running back Frank Gore, whose 64- and 80-yard touchdown runs this season can scare the ink off a coordinator's play sheet. The downside of blitzing is that if the offense has the right play called, there can be a huge hole for a running back. It's one reason Capers refused to blitz Brett Favre in the two Minnesota Vikings games; he feared running back Adrian Peterson would scorch him. "That's the thing, you have to make sure you're gap sound," Perry said. "When you zone pressure, sometimes guys get out of their gap too quick. If you're slanting the wrong way, you get creased. You have to be conscious of that. That's why if a team is running the ball, you have to be a little more selective than when you pressure and when you don't." And that is what specifically bothererd me about the game plan on Sunday. What they (Dom Capers and the Safeties coach, Joe Perry) said in that story is football 301 material. There are some significant downsides about blitzing that keep a defense from doing it as much as its fan base wants. Before we get into this week, my conscience demands I again make this disclaimer: I don't know that much about this stuff. I did not play football above the 8th-grade level. Everything I know about football comes from watching TV and playing Madden. There are a lot of things going on in these drives that I don't pick up on. Further, I have no doubt that I watch these plays with a certain amount of inescapable bias. I have opinions about teams and players that come from more or less nowhere, and without meaning to, I will see things and try to force them into my current understanding of things rather than change my understanding to fit the new evidence. I try to avoid this pitfall, and I try to see all the nuances of every play, but I want to be upfront about the fact that I know I do not come that close to achieving either goal. That said, there is still value in the words that follow. At least I'm getting some of it, you know? 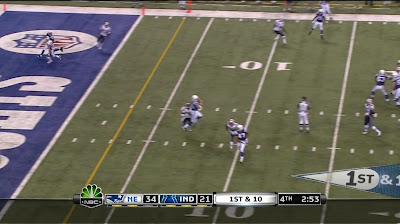 I think it would be the most fun for everyone to focus on the Patriots and Colts game, specifically the Colts' final two drives. The Colts open the drive With three wide receivers: Wayne to the far left, Collie in the slot to the left, and Garcon to the right. Dallas Clark is at the tight end spot to the right for a nice, balanced look. Manning is in the shotgun with Addai to his left. From what I can see on TV, it looks like the Colts run the four verticals play, with four receivers all just running more or less straight down the field. That gets the coverage dropping deep, which opens up room for Addai coming out of the backfield. Specifically, New England is deploying pretty much just one linebacker (Adalius Thomas and Derrick Burgess are on the field, but they're playing defensive end and exclusively rushing the passer. Some of this is strategy, some is thinness along the line because Ty Warren and Jarvis Green were not available due to injury) with the other coverage men all being defensive backs. This is your average dime package. Based both on looking at this play, and the general trend of all the plays that follow, I think Addai is primarily the responsibility of that one linebacker Jerod Mayo. In this case, Mayo follows Clark going deep, and Addai settles down into the wide open middle of the field. The defense is basically conceding ten yards underneath, and Addai picks them up. This was certainly not the time a receiver would be open because of attention being paid to other receivers, especially Dallas Clark. 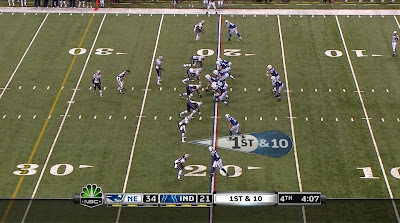 The Colts execute their second play from the same three-wide formation. In fact, the first five plays of this seven-play drive are all from that same formation with basically the same personnel in the same positions (the lone exception is when Austin Collie has several plays in his direction in a row and takes a breather). I think, both from watching this drive and from getting an impression of the Colts reputation, this is an element of their success: they are very simple. They rarely use motion, everyone stays in the same spot on the field, they keep their formations pretty basic. The key is that everyone is comfortable in their roles and gain a high level of expertise in doing their specific functions. This is, in fact, an even larger theme. The Colts have had the same offensive coordinator for Manning's entire career (though it looked dicey in this offseason), and though I don't have the time to make a full study, I would bet they have one of the fewest rates of turnover on the coaching staff in the league. Focusing back in on the drive, think of the advantages this provides: as Manning is calling the plays as everyone is rushing back to the line, you only have to worry about knowing your route (or blocking assignment), so you can line up faster, take less time between plays and still have more time to read the defense pre-snap. And once the play starts, it's easier for Manning to have chemistry with his receivers. A few years ago, Peter King had a thing about how Manning would throw to receivers whom, because of the position of the defenders, Manning could not see, but he would get big completions anyways because they had run the play enough times in practice that he felt confidence he knew where they would be and led them properly. Having never played quarterback professionally myself, I do not know how common this is, but it sounds damn impressive. From this formation, Dallas Clark runs straight up the field while Austin Collie who runs more or less a drag route. Collie is always heading right, but at first it has more of an upfield tint to it before he makes a cut and really commits to running across the field. The cut is key because as he does it, he jostles the defensive back a little and creates separation. the Patriots are in man coverage with two deep safeties. When Addai stays in to pass block, Mayo follows him by rushing Manning. Clark has taken his man deep and the safeties are so deep as to not be a factor, so Collie is being defended only by his man, who he is now separated from, and has an easy catch over the middle. With the Patriots playing this sort of defense pretty focused, with the safeties as they are, on preventing anything deep and to the sidelines, this sort of pass is pretty available. On the next play, most of the action happens down the field in the running of the routes, but the camera doesn't capture it at all, and with the hurry-up tempo, there's no time for replays. Luckily, Chris Collinsowrth is doing color, and he explains things pretty well. According to Collinsworth, Collie looks at first like he is running a "middle-read" route. That's where the receiver reads the coverage to decide between a post route and a square-in (or I guess they could add other choices if they want) with the idea being just to find open space to work in. Once he gets everyone going to the middle, he breaks back outside and makes a catch outside the numbers for 17 yards. The ball is actually underthrown kind of badly, but he's fooled everyone enough on the route that he is able to come back to make the catch. The ball is underthrown because Manning gets hit as he's throwing. It's the most pressure he sees on the drive. Addai is staying in to block, and he looks first to left tackle Charles Johnson blocking Adalius Thomas, sees Johnson seems to be doing okay, then turns his attention to a matchup on the inside where a defensive tackle is getting penetration and goes to help there. Just after he's turned his attention, Thomas beats Johnson and goes by him to hit Manning. There's been a lot of talk on the station this week about pocket presence, especially as it relates to Aaron Rodgers. I would have been interested to see Rodgers run this play and if he would have had the sense of pass rush Manning displayed on this play. I kind of suspect he wouldn't. On the next play, Dallas Clark and Pierre Garcon run complimentary routes that cross one another. After they cross, Clark turns back to Manning while Garcon keeps going down the field. All the action over there draws the two defenders lined up over them in addition to the middle linebacker Mayo and one of the two safeties on the play, who comes up to defend this area. The other deep safety stays pretty close to Reggie Wayne once it's clear he's going to challenge deep. All that leaves Austin Collie one-on-one. Collie is running deep diagonally down the field towards the opposite sideline. The ball is again a little underthrown and Collie can't necessarily run to get it, he has to slow down, brining him back to the defender. Collinsworth again helps me out here, explaining that Collie made a conscious decision here when he came back to the ball to jump into the defender, which drew a pass interference penalty. It's akin to a basketball player going up with the intention of drawing a foul. If you'll remember, Collinsworth chided Miles Austin last week for not executing this move. Well, Collie executes it perfectly and though it's certainly a little cheap (the defender didn't really do anything wrong on the play. In fact, pretty much the only person making a mistake here is Manning for not leading Collie more), it works and gains 31 yards. It's on that last play that Collie goes to the sideline to get some Gatorade or something, so Clark goes in the slot with backup tight end Gijon Robinson sliding into Clark's spot. Clark runs diagonally across the play as Collie has been, but once he's in about the middle of the field, he breaks off the route and turns back to Manning. Robinson does roughly the same thing going the other way. Shortly after Robinson crosses Clark, Manning hits Clark with the pass. Normally, this might be kind of dangerous with Robinson's defender there underneath the pass with a possible shot at picking the pass off. In this case, however, the defender on Robinson is very dedicated to jamming him, and his sole focus is still on jostling Robinson. Had he looked up, he may could have been trouble. But Manning sees he's not looking up and completes the pass. Clark is open because he is much bigger than the corner. His route to the inside puts the corner behind him and he just uses his much bigger frame to shield the corner away from the play. 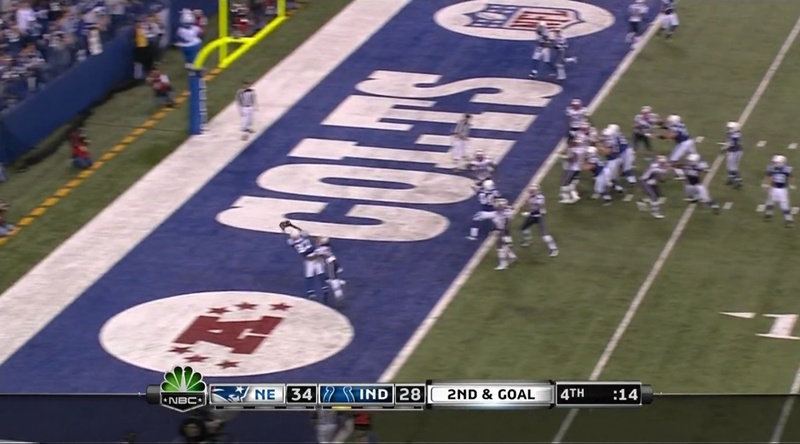 Now only four yards from the end zone, the Colts try a fade pass. It doesn't work, and it's kind of boring, so let's not spend any more time on it. On both the failed fade and this final play of the drive, the Colts have made slight alterations to their formation: they flip the play, putting the tight end on the left and the slot receiver on the right in addition to putting Manning under center. The Patriots make no alterations to their formation, still playing with their outside linebackers as defensive ends and just one other linebacker to go with six defensive backs. Part of the presence of this personnel can be attributed to the fact the Colts do not huddle after the pass interference call for Collie, giving the Patriots no chance to substitute. 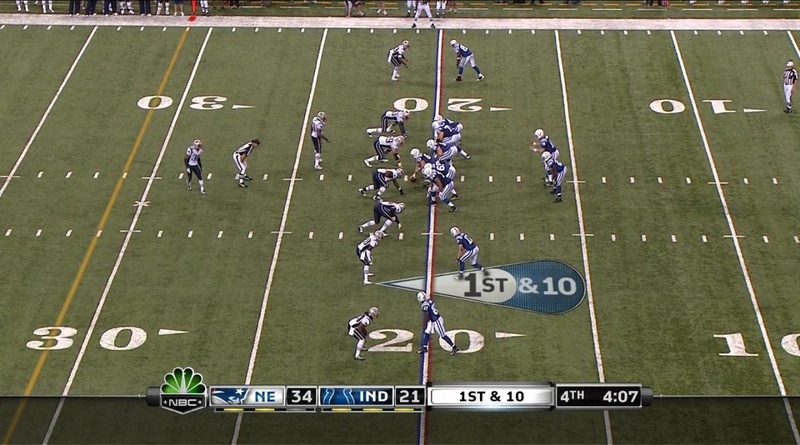 To take advantage of this light personnel, the Colts go to a run play to the right. Right tackle Ryan Diem does a superb job blocking Derrick Burgess, handling him by himself and pushing him back to open up a hole. 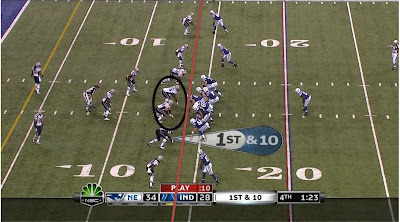 The real key to the play, though, is right guard Kyle DeVan and center Jeff Saturday getting a double-team on Vince Wilfork, standing him up and getting him moving back. All of these efforts create a clean running lane for Addai, and with Wilfork being blocked, Jerod Mayo can't see over him to find Addai. Mayo gets a little lost and by the time he gets a read on Addai, he's running by him and to the end zone. The second drive again features basically the same formation throughout. There's Wayne on the left and Garcon on the right. Collie is in the slot to the right with Clark at tight end to the left. Manning is in the shotgun for the first play, but is under center for the rest of the drive. 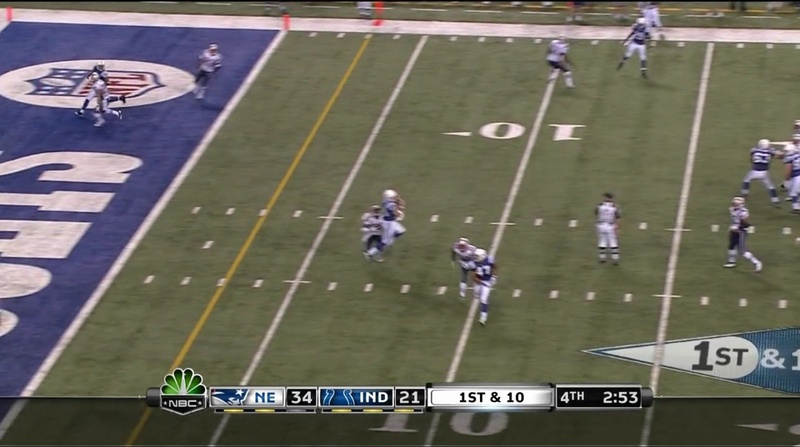 On the first play, Reggie Wayne runs a little square-in about 15 yards downfield. 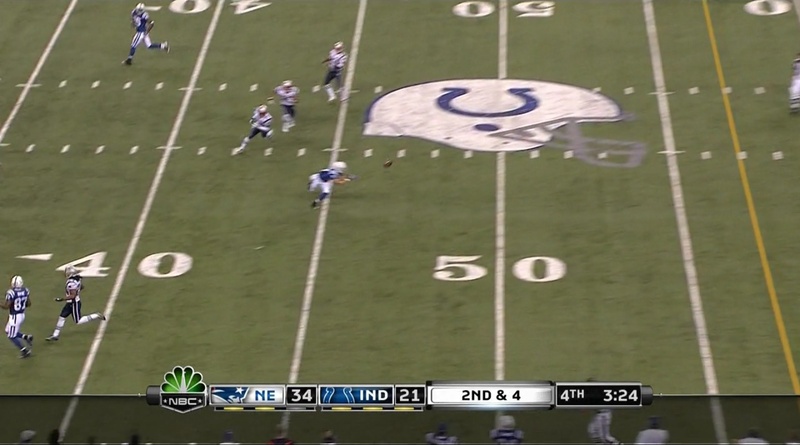 Dallas Clark is moving from the right to left and takes any underneath defenders between Manning and Wayne with him. Wayne also runs the route sufficiently in front of the deep safety. At the line, Wayne does a little stutter outside before heading upfield inside of the cornerback. That way, when he breaks inside, he does so without resistance. The cornerback is just trying to catch up. The route does take a little bit for Wayne to get deep and make his cut, but Manning does a really good job moving in the pocket to keep away from the pressure. The Patriots have continued to defend the Colts with the same personnel they have all game: lighter, more outside-linebacker-types for defensive ends, one real linebacker, and six defensive backs. The Colts again take advantage of it for one of the few successful running plays of the game (or season). The formula is very similar to their touchdown. Diem again handles Burgess by himself, while Clark takes on Adalius Thomas by himself on the backside of the play. That leaves four offensive linemen to double-team each of the Patriots two legit defensive linemen, Vince Wilfork and Mike Wright (those two tackles average 310 pounds while the ends average 265). 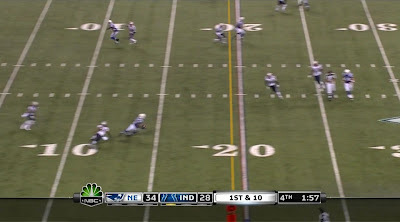 The Colts get those two defensive tackles moving backwards with authority, and Addai follows them for 5-6 yards. The same thing appears to happen again, with the defense unable to see around those defensive tackles. The entire defense is out of place after that, and the only thing that stops it from being a touchdown here is the deep safety being far back enough to read the play and take Addai down after 13 yards. The Cotls run the ball on the next down, but the execution is not as good, and it gains only one yard. Let's just gloss over it. The touchdown play is very simple on the Colts' end and very confusing on the Patriots'. The Cotls run your standard slants/flat play. Both outside receivers run a slant. Collie runs to the flat. Wayne again does his stutter to the outside, which could mean a fade, but then runs the slant to the inside. He also uses a nice little push within the allowed limits when making his cut. The point is, he gets inside the corner. The throw is a little high and pretty far in front, and Wayne does a splendid job of bringing the ball in. 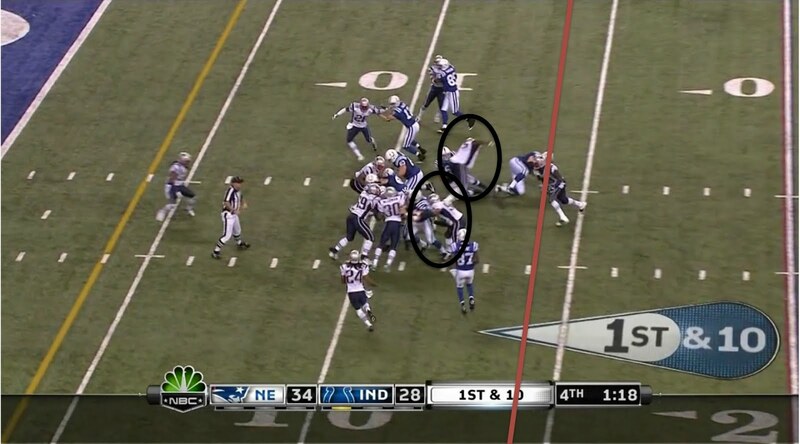 The confusing elements of the Patriots' is their defensive alignment. Everyone is crowded right at the line of scrimmage with only one defender out covering the receivers. There is no one any deeper than two yards off the line of scrimmage. The two defenders on the outside, the ones who I would think most likely to get in between Manning and Wayne both devote their efforts to jamming Clark at the line, paying no mind to the pass whizzing by them. As I think you can see, the focus on Clark opened up a lot of things for other receivers during this game. Clark did finish second the team in catches, but he was fourth in targets. Manning saw the effort New England devoted to jamming and covering Clark and decided to go elsewhere with the ball throughout much of the game. After the first few drives and carrying through until these drives at the end, the Colts used Clark in the slot with Gijon Robinson at tight end. I can see how switching to Collie in the slot and Clark at tight end would allow them to turn things around as they did: Collie is a much better receiving threat than Gijon Robinson, better able to take advantage of the one-on-one coverage created by the focus on Clark. Further, putting Clark on the line gums up the short middle of the field, which, if you have to gum up somewhere, that's probably a fine place when trying to come from behind. Consider also that with Clark covered every down and Wayne covered on some of them, Manning often had to go to Pierre Garcon before Collie entered the mix. Garcon was terrible in this game: of 11 targets, he was only able to make 3 catches. Compare that to Collie who made 6 catches out of his 8 targets. Switching out Collie for Gijon Robinson on the field allowed Manning to move away from Garcon, and that played a big part in turning the momentum. Collie's no star, but he proved able to beat single coverage and make a catch. When you have Reggie Wayne and Dallas Clark on the field, Austin Collie is going to see almost exclusively single coverage. With someone like Peyton Manning, there's a tendency to fall all over one's self complimenting him. It's a safe thing to do. No one will think you're dumb for saying Peyton Manning is good (though they might think you're uncreative). So I might be falling into that trap with this next bit, but I was pretty impressed by how he made the correct read to find the least defended receiver on every play we looked at. I don't know if that's something exceptional or if it's something every quarterback does but I want to call it exceptional because he wears number 18, but we certainly saw last week that Josh Freeman did not find the least covered receiver on every play. 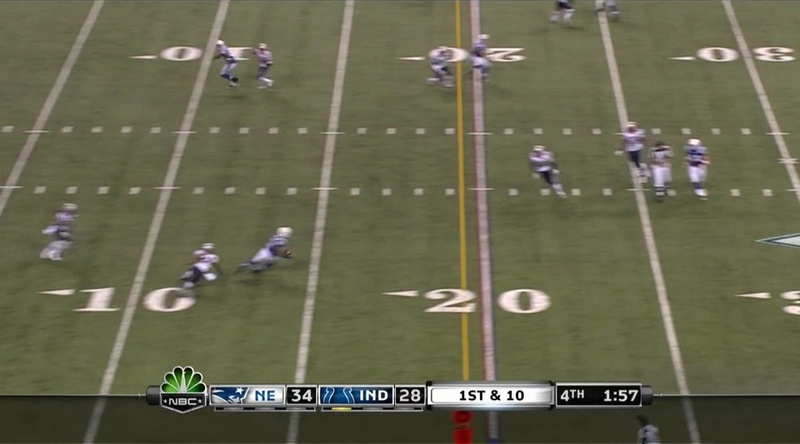 In fact, go back and watch the Patriots' already-legendary fourth-down play in this game and watch how open Wes Welker is. It might be an underrated skill, and it's one Manning showed on every play of this drive. Watching him, he makes quarterbacking look so simple. He has had amazing throws in his career, but I don't think we saw too many here (in fact, you've read that many were pretty off-target). What he did here that was even more valuable than showing off his arm is just identifying the receiver most likely to succeed and throwing it in his direction. Just by doing that he was able to win what seems it will end up being the defining game of this regular season. Roy Williams goes over 100 yards, so it would seem that we could just call his day a success, right? It doesn't show the fumble or the drop. Also, the Miles Austin shine is off a bit after a week where it took 9 throws to get 20 yards. He is not sneaking up on anyone anymore. And Martellus? It is tough to claim he is much better than John Phillips as an offensive weapon after 10 weeks. I find it interesting that the number of targets is so close amongst the top 3 WR's. Austin at 55, Williams 52, Crayton 49 is as close as it gets after 10 games. There are many reasons for this, but it does look like they are spreading the ball around reasonably well. Also, Williams last 2 weeks has helped him back into the conversation of whether he can compete with Austin and Crayton. I do this project not because it makes any money or because it is something I have to do - but rather, I compile these numbers (with help from a few friends) every week so that we have substance behind opinions. It is easy to say that "Jason Garrett had a horrible Sunday", but if you don't have any substance from the whole season with which to compare it to, you are merely making an observation that may or may not have merit. I believe the whole point of this exercise is to be able to break down a game like Sunday and point to specific issues with his job performance - good and bad - and offer an "exit interview" from each week like I assume they do in coaches meetings at Valley Ranch. I have also heard this week that it wasn't the fault of the play calls, it was the fault of the exectution on those play calls. I don't completely disagree, because the exectution was poor (Williams fumble and drop, Romo's decision to force ball to Witten, OL getting beat badly in pass protect), but the concept of going on the road as a team that has demonstrated they are deadly out of their base offense, and abandon it completely when the score was still 0-0, or 3-0, is a big issue. We keep these numbers to point out that week after week, despite the popular opinion that the Cowboys are "good" at Shotgun-3 WR offense (S11), the facts are they are not good. And when they get in a position where it becomes their bread and butter, the opponent begins to salivate and plots exotic blitz after exotic blitz to expose and attack the pass protection. Then, the Cowboys counter by leaving Jason Witten and the RB in to help max-protect, and the problems for the offense get even worse because their best weapon is no longer in route. Despite preparing for what they knew was going to be quite a challenge, the Dallas Cowboys found that it is sometimes difficult to finish running the sword through a team that had lofty expectations and has been kicked like a dog for 2 straight weeks. The Green Bay Packers likely will eventually be finished off soon in their quest for the NFC Playoffs, but it won't happen yet, as evidenced by their 17-7 win over the Cowboys at Lambeau Field. This Cowboys' offense, which at times has looked as dangerous as any offense in football, failed to make even the slightest mark on the field Sunday, and allowed drive after drive to end without ever really flexing its muscle. And, of course, on those rare occasions where they actually did get out of their own way, the Packers' desperate defense would rise up and make a play and end the threat. "Patience - So, now that we all know the Packers are a wounded animal with plenty of game breaking talent on both sides of the ball, we must understand that the only recipe to handle them is patience, precision, and composure. The Cowboys showed tons of that in Philadelphia, but that doesn't carry over. They must withstand the initial burst of energy from the crowd, and weather the storm. Usually, this means high percentage passes and pounding the rock between the tackles. I believe if the Cowboys turn the ball over less than 2 times, they win this game. But, it is vital on the road (and there are plenty of stiff road tests ahead) to play a clean offensive game. That starts with a patient Tony Romo and Jason Garrett. This team did not do that at all. The Cowboys went back to their road ways that suggest they cannot handle failing on offense. This happens time and time again in road wars: @ Pittsburgh, @ Denver, @ Green Bay; When they cannot get in the end zone early, as the game goes on, they start to get more and more impatient. They start to pass in running situations. They start to go "shotgun" and sling it around - which only invites more blitzing and more chaos from the defense. They do not stick to their game-plan of what they do well: Power Football. Every week in the NFL, we see an ambush. Philadelphia loses at Oakland. 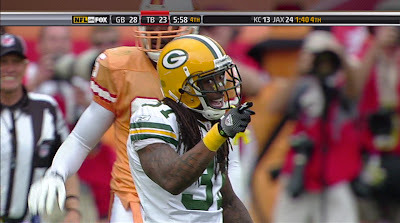 Green Bay loses at Tampa Bay. Dallas comes extremely close to losing to Kansas City. 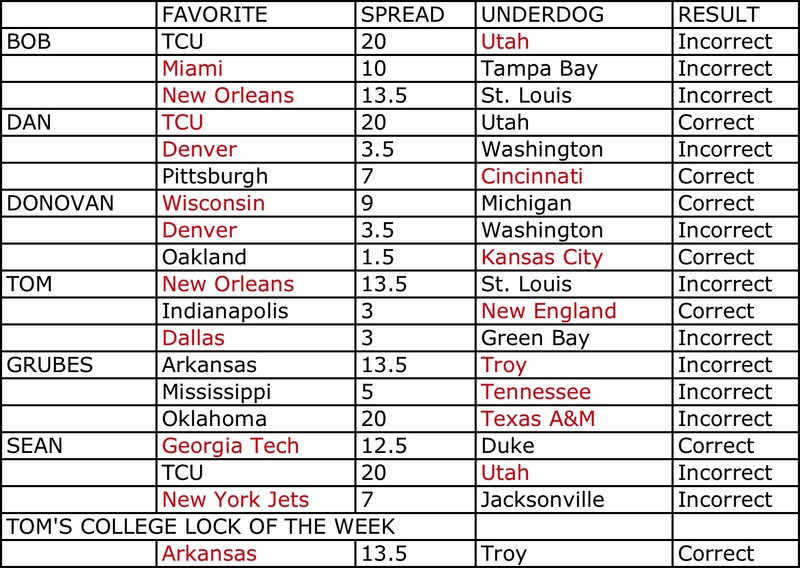 All the conditions are the same; a team that is a pretty substantial road favorite rolls into a place where two things happen - 1) the road team that is the favorite thinks that the game will be easy because they have been told all week that they are better, and that the home team is not very good. 2) the home team is told all week that they don't belong in the NFL and that we should be lucky if the team coming in to play them on Sunday doesn't demolish our poor stadium before the game is over. 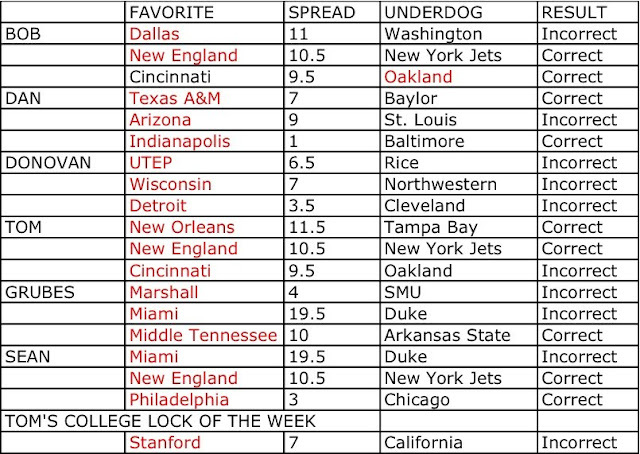 The Cowboys are a 3-point favorite right now, so if you factor in the home field number (add 3 to the home team) then you can surmise that the oddsmakers see the Cowboys as 6 points better on a neutral field. That sounds about right. Last week, the Eagles were coming off the surge of beating the Giants handily, and the Cowboys were being challenged at every turn with the 44-6. Now, the Cowboys are being congratulated for beating the Eagles, and the Packers are being further humiliated all week for their last two weeks with the Favre-a-geddon and the Tampa loss. I lead off this story with all of this information not to set you up for a Green Bay prediction, but to merely remind the Cowboys organization (that surely include this piece in their weekly preparation, right?) that all of the conditions are right for an ambush on Sunday at Lambeau Field. The Cowboys should win on Sunday. But, this is not college football where the favorite can play as poorly as possible and still be able to win. In the NFL, if you give an underdog a chance early, it could put you in a hole you cannot dig out of for the rest of the day. Admittedly, this is a fairly odd position for me to be in this week, but over the 12 seasons of covering Dallas Cowboys football, there have been several meetings between the two teams, so I have certainly grown accustomed to the oddness. To me, the Green Bay Packers do not represent the "enemy", but for purposes of continuity, the title of the piece shall remain the same. 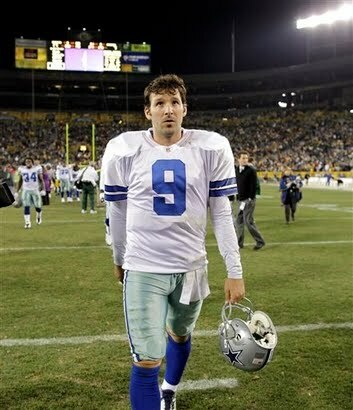 Also, since I don't play for the Cowboys, any awkwardness would be for Tony Romo (another life-long Green Bay fan) to work through, at it appears he hasn't had any difficulty doing such a things. His numbers in his 2 games against Green Bay are a 2-0 record, 36-60, 569 yards, 569 yards, 5 TDs, 1 INT and a passer rating of 105.5. He seems pretty nervous. In 1967, the Green Bay Packers finished a run of 5 World Championships in 7 years by beating the Oakland Raiders in Super Bowl II. It was the 2nd time the franchise had won 3 consecutive NFL Titles (something that no other franchise has ever done even once). Vince Lombardi left the franchise a few days later. 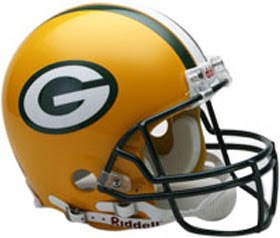 From 1968 until 1991 (24 seasons), the Packers enjoyed just 4 winning seasons (never consecutive). They made the playoffs just twice, and only once (1972) in a legitimate full NFL season (sorry, but making the playoffs in the bogus 1982 season with a 5-3-1 record does not impress anyone). They were an absolute mess, who had totally undone everything that Vince and the Packers dynasty of the 1960's had built. The Green Bay Packers franchise was irrelevant in the NFL, aside from being the punchline destination for players who angered their teams. Then, in 1992, Ron Wolf was hired to be the GM of the Packers. He hired Mike Holmgren. They traded for Brett Favre by sending the #19 pick to Atlanta for him, and both teams felt like they won the trade decisively. For the next 7 years (92-98), Holmgren, Favre, Wolf, and Reggie White helped design a model-franchise. 7 years, 7 winning season, 6 playoffs, 3 NFC Championship games, 2 Super Bowls, and 1 World Title. It was too good to be true. Their franchise QB had won the NFL MVP in 1995, 1996, and 1997, and was now just 29 years old. The sky was the limit for how many more could be won. This was a time when successful NFL Coaches would take their success as a sign that they needed to do more. "Buy the Groceries" was a cliche Bill Parcells used, but it applied to many others - including Holmgren. Despite having one of the most successful stints an NFL Coach had ever had in such a short time with a team, he had to be the GM, too. The Packers had Ron Wolf already, so there was no opening in Green Bay for that title. Therefore, Holmgren resigned from the Packers to take an 8 year contract from the Seattle Seahwaks to be both Head Coach and General Manager of that franchise. It didn't make a whole lot of sense, but Green Bay fans were not sure it was that big of a deal, since they still had the NFL MVP running the show. It was a very big deal. Holmgren knew how to coach Brett Favre. He knew how to harness him. And most importantly, Favre was interested in hearing what Holmgren had to say. I made a promise to myself that whenever Tampa won their first game, I would diagram the key drive, so I fulfill that below. As an added benefit, it's also a nice chance to evaluate new QB Josh Freeman and to see what went so wrong with Green Bay that they allowed Tampa to notch a win. The Buccaneers open with a little trick we saw San Francisco try a few weeks ago. Josh Freeman appears to be under center in a two tight end set. Freeman then stands up and moves back into the shotgun as one of the tight ends moves out wide to create a shotgun, three-receiver set, totally changing things for the defense. The two tight ends are Kellen Winslow and Jerramy Stevens, both of whom have been thought of as top-end receivers at certain points, though probably not now (definitely in the case of Stevens). They are the focus of this play. It is Stevens who splits far out to the right with Winslow staying on the offensive line, though now standing up. 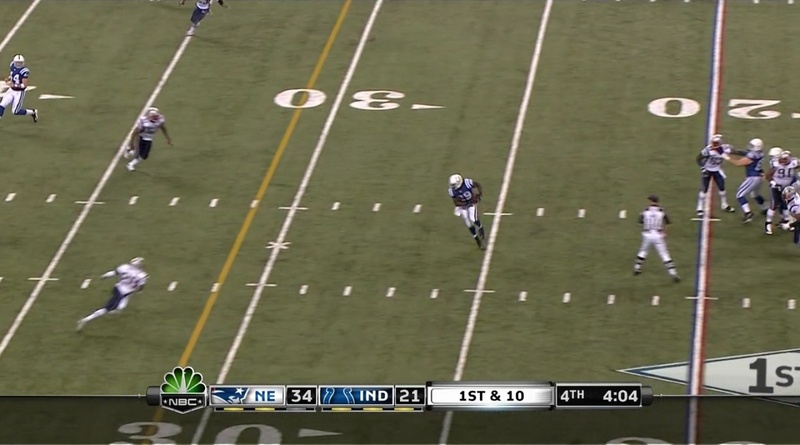 Stevens runs a little out route to the sideline. Winslow comes behind him with kind of a smash route. I say ‘kind of’ because, though he is out of the view of the camera when he makes his move, it looks like Winslow doesn’t have a hard cut when he heads to the outside but rather is running up the field and towards an open area. That area is behind the corner, who goes with Stevens, but in front of the safety. The announcer, Tim Ryan, says the Packers are in Cover-Two, and if so, the area Winslow’s in is certainly a weak spot in the coverage. DCFanatic is cool, and he also must have plenty of time on his hands, because he made this audio dance by adding his video to yesterday's Martellus Bennett Show. When 5 different receivers have at least 38 yards, you have a balanced, dangerous attack. Who knew that the Cowboys had a plan up their sleeve for Kevin Ogletree, but that WR screen that converted 2 3rd and longs was most effective. And, look! Roy Williams with a reasonable contribution. It was a major step forward for #11. When a guy has 600 yards and nobody else has 400 and when that same guy has 7 TDs when nobody else has more than 2, you know who your #1 WR is, right? Miles Austin is an amazing playmaker right now.